WordPress with its great endless usages is always one of the serious solutions for almost any web-based projects, from simple blogs to advanced eCommerce portals. Thanks to the professional community of WordPress designers and developers who made it possible for us to benefit from WordPress in various projects. 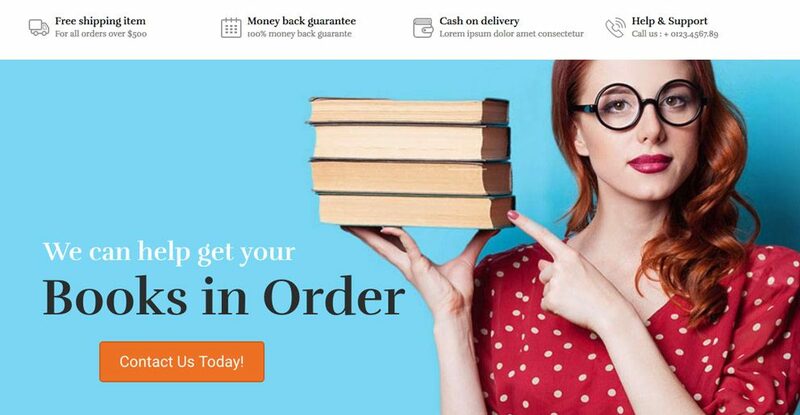 Making an online bookstore could be an intimidating task. If you do a quick research, you will find several platforms other than WordPress, but when it comes to ease of use and cost of running, WordPress shines so brightly most of the time. In this posts, we will be featuring 7 best Bookstore WordPress themes for those who are looking to build an online store to sell books online. The themes listed here are all based on WooCommerce, the leading e-commerce plugin, and come with multiple options optimized for online shops especially bookstore shops. BookJunky is a WooCommerce WordPress theme specially created for bookstores, helping you build your fully responsive bookstore using WordPress without much effort. It’s a totally new theme released in September 2017 and best suited for bookstores, libraries, authors, and publishers. The shop is actually backed by WooCommerce, the leading online shop plugin for WordPress which brings all you need to start a successful online bookselling business. Along with optimizations for WooCommerce, it also includes the popular Page Builder plugin, Visual Composer as well as Slider Revolution for free. 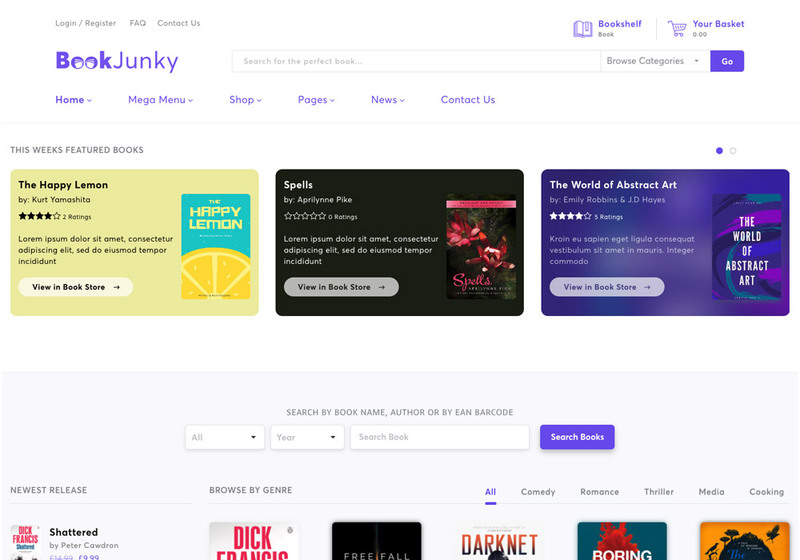 With BookJunky, your users can have a front-end profile which allows them to view their bookshelf, where all their saved books can be found. Finally, I like the design so much because it’s easy to understand for users, clean and to the point. Your users can filter books by genre on homepage using a well-designed tabbed section. Take your time and browser the demo and you won’t get disappointed! 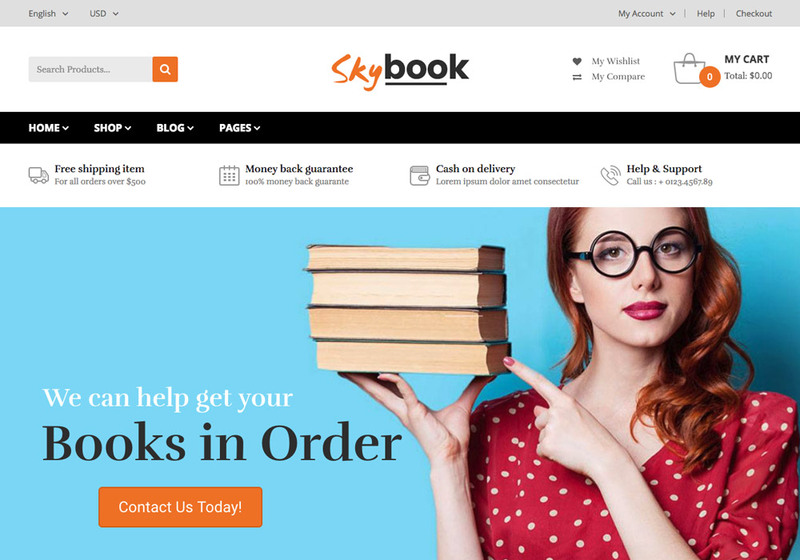 Another Bookstore WordPress theme featured in this list is VG Skybook, a WooCommerce based theme for online stores selling books, ebooks, and other digital products. Also, it could be used to create affiliate sites linking to stores like Amazon. VG Skybook is fully responsive so that it looks perfect on smaller devices such as mobiles and tablets, bringing better user experience for all of your visitors, which will cause better ranking in SEO and consequently more sales. According to the theme author, they generously offer a free installation service worth $50 to you if you use the theme. Of course, the installation won’t be a big deal as it comes with an option you can use to import exactly what you see on demo site. Furthermore, it supports the right to left languages as well, so your Arabic, Persian, or Hebrew website will look perfect if you use VG Skybook. Finally, VG Skybook includes 6 home layouts inspired by different bookstores allowing you choose the best bet for your online bookstore. 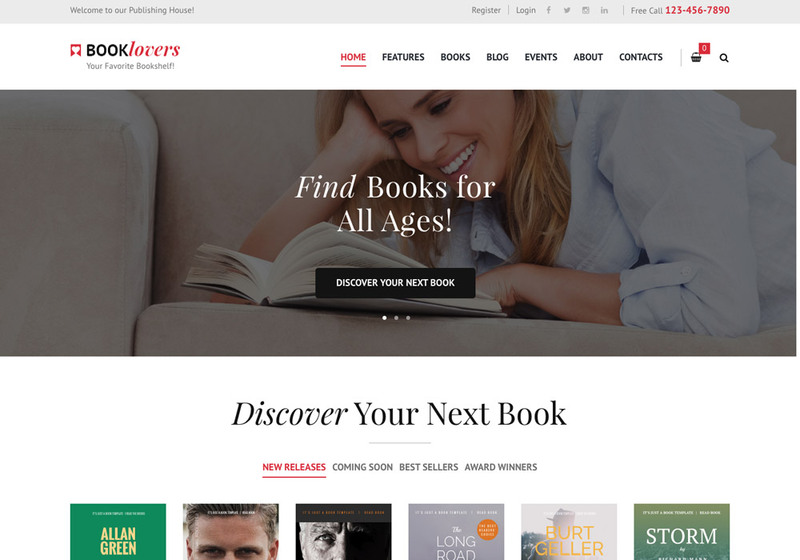 BookLover is popular Bookstore WordPress theme which eases the process of building an online shop for books, ebooks, and publishing houses. It comes with a responsive design out of the box meaning that your visitors will have a perfect experience using your website on their mobile devices. And, being based on latest version of WooCommerce, allowing you to run a modern online e-commerce in the easiest way possible. The theme comes with 4 unique homepages, support of visual composer page builder, revolution slider, and support of the leading multi-lingual WordPress plugin, WPML. 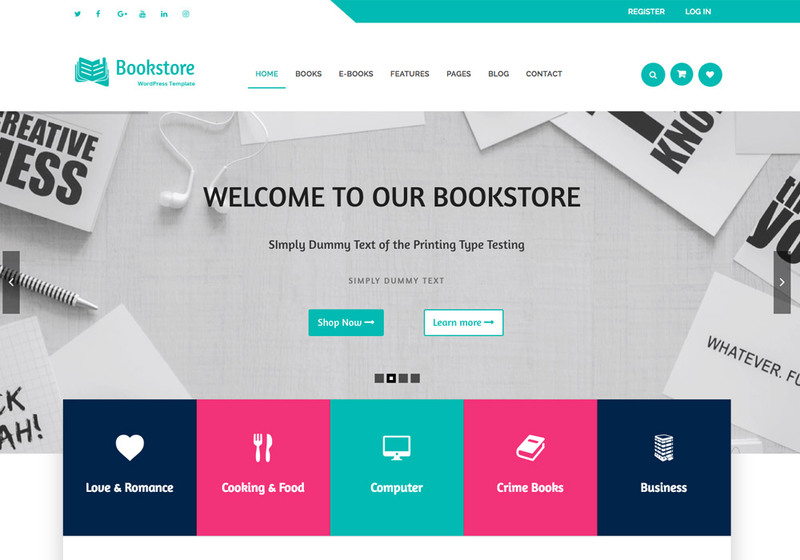 If you’re looking for tested Bookstore WordPress theme, this one would be a great choice for you as it has sold more than 400 copies and got 4.5/5 stars rating from the users. 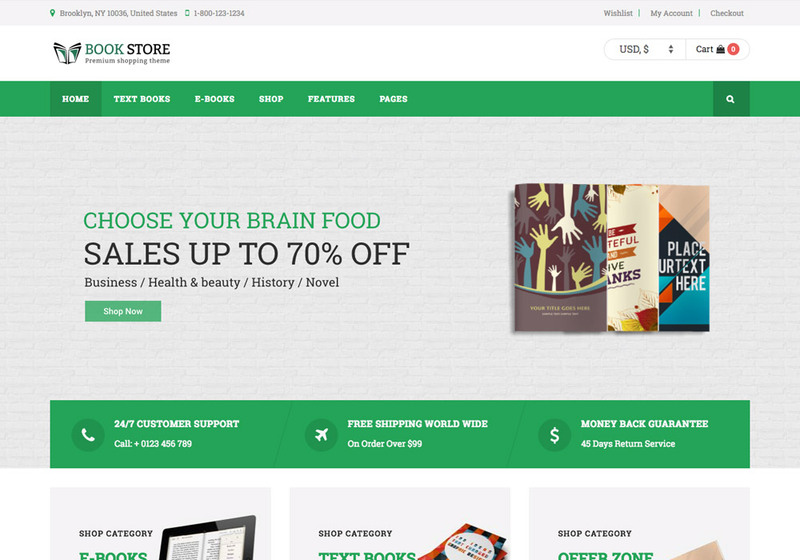 Meet “Book Store” a responsive WooCommerce theme has been created for libraries, bookshops, digital products, ebooks, software, apps, bookstores, and more. It is also based on WooCommerce which is the most popular eCommerce toolkit for WordPress. The theme has a creative design packed with an attractive mega menu, five product style layouts, multiple header variations, and five unique homepage layouts, all giving you countless possibilities to be creative while building your Bookstore website. There is a product layout designed especially for books, with a digital version of a bookshelf containing books on it. If you hover your mouse over each of books, a button will reveal to let you add it to your shopping cart. It’s a fun way to sell books by the way. Book Store has everything you might need to sell books online, take time and check the demo. Similar to the previous theme, this WordPress theme’s name is BookStore but with a totally different design and characteristic. As you scroll down the design and check different sections of the theme, you get noticed how much effort has been put into this theme. In fact, you see some UX best practices considered in order to benefit from the standards for such bookstore online shops. BookStore includes several ways allowing you personalize your websites easier, such as various header styles, multiple blog layouts, page builder, PSD files, and different color schemes. So feel free to play with the options and make a unique online shop for your visitors. 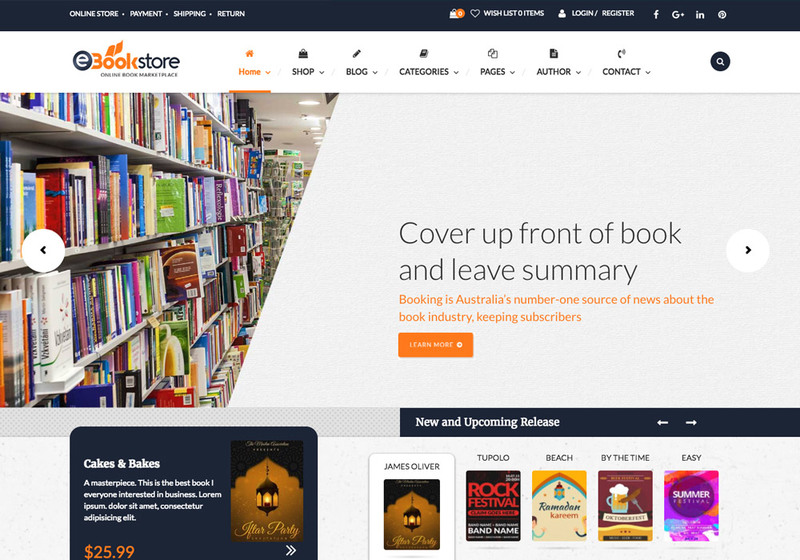 Here’s another WordPress theme exclusively built for online bookstores. BOOK STORE is a five-star rated solution for those who are going to build an online store to sell physical products or digital ones. The shop design is somehow more generalistic and can be used for any type of online stores. The theme includes a number of features that help you make a better online shop such as the tabbed product slider, featured products section, and mega menu. It also includes a free license of Visual Composer, Slider Revolution, and VC mega menu plugins. Also, it’s compatible with WPML which allows you run a multi-lingual shop, and finally it supports the popular one-click demo import which makes the installation of the theme super easy. 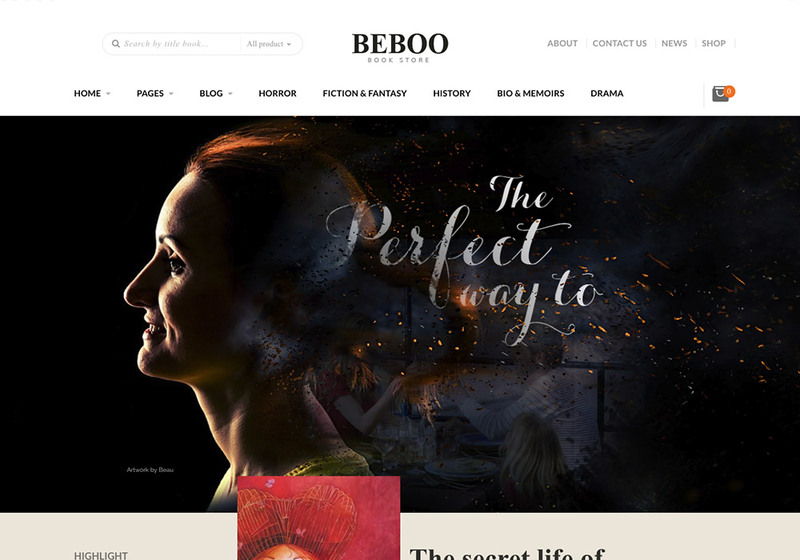 We usually don’t include those WordPress themes that were released more than a year ago, but BEBO is worth mentioning because it’s not an outdated Bookstore theme. It has got several updates – the last one was in September 2017. BEBO comes with an outstanding design and amazing features. Take a look at the visually impressive homepage designs: classic, highlight, story, author, publisher, library and full store. All of them are creative and functional. Also, check our other post on how to use WooCommerce to sell digital codes, pins, and licenses here.